Pachira aquatica is a commonly found houseplant called a money tree. The plant is also known as Malabar chestnut or Saba nut. Money tree plants often have their slender trunks braided together and are a low maintenance option for artificially lit areas. 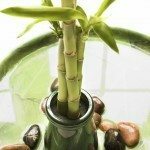 Money tree plant care is easy and based upon just a few specific conditions. Let’s learn more about how to care for money tree houseplants. Money tree plants are native from Mexico to northern South America. The trees can get up to 60 feet in their native habitats but are more commonly small, potted ornamental specimens. The plant has slim green stems topped with palmate leaves. In its native region, money tree plants produce fruits that are oval green pods divided into five chambers inside. The seeds within the fruit swell until the pod bursts. Roasted nuts taste a bit like chestnuts and can be used ground into flour. The plants get their name because the Feng Shui practice believes it will bring luck to the owner of this fun little plant. USDA zones 10 and 11 are suitable for growing a money tree houseplant. In colder regions, you should only grow this plant indoors, as it is not considered cold hardy. The Pachira money tree is a perfect addition to the interior landscape and lends a tropical feel. If you want to have some fun, try starting your own Pachira money tree from seed or from cuttings. These plants do best when they are in full sun to partial shade. The best temperatures are 60 to 65 F. (16-18 C.). Plant the tree in peat moss with some gritty sand. These plants like a moderately humid room and deep but infrequent watering. Water the plants until the water runs from the drainage holes and then let them dry out between watering. If your home is on the dry side, you can increase the humidity by placing the pot on a saucer filled with pebbles. Keep the saucer filled with water and the evaporation will enhance the humidity of the area. Remember to fertilize every two weeks as part of good money tree plant care. Use a liquid plant food diluted by half. Suspend fertilizing in winter. The plant should be repotted every two years in a clean peat mixture. Try not to move the plant around a lot. Money tree plants dislike being moved and respond by dropping their leaves. Also keep them away from drafty areas. Move your Pachira money tree outside in summer to an area with dappled light, but don’t forget to move it back in before fall. Read more articles about Pachira Money Tree.